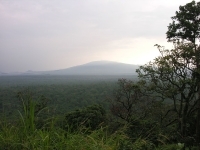 The Virunga National Park is a magnificent swathe of protected land stretching from the Virunga Mountains in the south, to the Rwenzori Mountains in the north. It was Africa's first national park, established in 1925, and has been a UNESCO World Heritage Site since 1979. The main attraction of Virunga is the population of mountain gorillas residing in the rainforest in the south, and guides can get visitors close to the critically endangered species on life-changing tours. The mountain gorillas are heavily protected and recent evidence suggests that the population is actually growing, which is hopeful. Apart from the gorillas, Virunga is still said to contain more bird, mammal and reptile species than any other protected area in Africa, and its landscapes are equally diverse. Although the park is likely to thrill tourists, and has the potential to be a truly great attraction, visitors should note that the region is still struggling with conflict and safety is always a concern when visiting Virunga.